The beginning of the school year can bring many emotions to parents: sadness because the summer went by too quickly, anticipation of getting back into the everyday routine and excitement because they won’t have to hear the phrase, “I’m bored!” quite as frequently. While these feelings all seem normal, there is one more that pops up more frequently than any of us would like, and that is dread. Did you know that the estimated cost to send a child back to school in 2015 in $630? As childhood poverty increases, it continues to become more difficult for families to find the resources to purchase the school supplies necessary to send their student back to school. To help combat the high costs of school supplies, the Wisconsin Lions and Lioness from around the state and schools have formed a partnership named Stuff the Bus! Stuff the Bus is like a food drive, but instead of canned goods, local Lions Club collect new or unused school supplies that are then donated to area schools. The official collection date was last Saturday, August 8, but many Wisconsin clubs are collecting throughout the month. You can still participate to find a collection site near you. 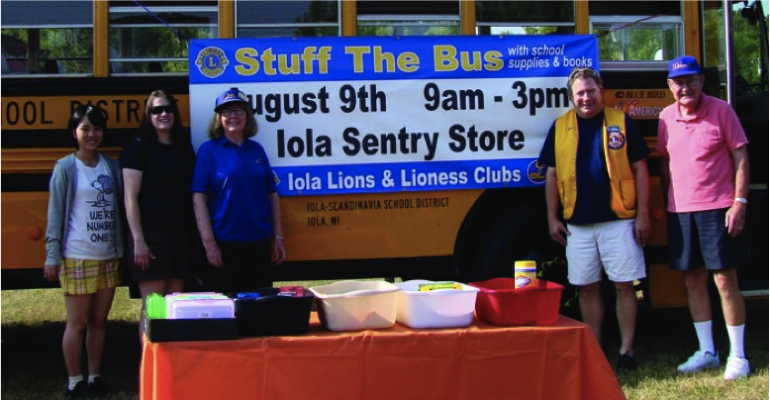 Lions Pride is so proud to support the local Lions and Lioness Clubs who taking part in Stuff the Bus 2015. Together, we can all work together to help take the strain out of back to school shopping for families around the state of Wisconsin. Where did the summer go? It seems like only yesterday that a new group of campers were just arriving at Lions Camp for a week of fun. However, it’s now time for kids to trade in their sunscreen for a backpack filled with all sorts of school supplies. While this is an exciting time of the year for parents and children, it can quickly become stressful when it’s time to start purchasing a year’s worth of school supplies. Did you know that in 2013, it was estimated that it cost approximately $631 to send a child back to school? As child poverty continues to rise, it can become especially difficult for families to provide children with the resources that they need in order to learn. The Lions of Wisconsin are on a mission to help these families in need by taking part in Stuff the Bus and you can help, too! Still time to help, you can donate new or unused school supplies or books to one of the collection sites. Please click here to see the needed school supplies. Your Lions Club can also get involved by hosting a collection drive, contact MD27 Coordinator Jodi Burmeister at lionsstuffthebus@gmail.com or 608-444-9127 with any questions. Remember, anything you can do today will help a child tomorrow. Together, we can work to help area children get the resources that they need to be their best.